Since we last looked at the Alexandra Restricted Airspace application for UAV testing, there have been some developments. Following a public consultation meeting held on 18 September, and requests from users, the closing date for submissions has been extended to 5 pm on Wednesday 07 Nov. The CAA has refused to release details of any risk assessments and Alexandra aviators are now threatening legal action against the proposal. There are some important issues at stake here, and we encourage everyone to think about the bigger picture. Are you content to see New Zealand GA airspace being given away by the Regulator to commercial interests for “research and development”? When looking at these proposals being pushed by big overseas dollars, it would be easy to imagine the CAA, along with the relevant ministers in Wellington, being lobbied to grant airspace to such private interests with minimal input from either the broader aviation sector or the general public. The discussion about who will ‘own’ New Zealand’s airspace in the future should be a topic for discussion and debate across the wider community with assistance and input from the traditional aviation sector to help with the technical and practical sides of the issue. To be honest, I’ve started viewing the Rocket Lab operation as benefiting the US-based owners far more than it benefits New Zealand. The politicians are falling over themselves, raving about New Zealand having joined the international space community when the reality seems to be that overseas interests have been granted exclusive use of land, ocean and airspace in this country to pretty much use as they please to produce significant financial gains for themselves well into the future. I understand that to build and launch their rockets, a good number of Kiwis are employed in the process, but let’s not lose sight of who stands to benefit more from the former National-led Government granting the Mahia site for Rocket Lab’s exclusive use. Seeing as the Mahia peninsula is already set aside for Rocket Lab, why don’t we just establish a restricted zone alongside, within or close to Rocket Lab’s boundaries, and designate the whole area specifically for UAV and air taxi development as well? One of the local towns received a lot of attention in the media when Rocket Lab’s launch facility was announced, with the locals happy to see improved real estate prices and revived economic growth as a result. If we could simply add the required airspace in that region specifically for companies wanting to carry out their R & D work with unmanned aircraft, they could leave the rest of New Zealand’s airspace alone and eliminate an enormous amount of stress for every community that, at the moment, gets challenged by a private company wanting to claim a large piece of public airspace for their exclusive use. Keep all such activities confined to the one designated region until such time as the technology allows both manned and unmanned vehicles to safely be integrated into one system in the future. Alexandra, New Zealand – August 16, 2018 – MAG Australia in partnership with Skybase, a New Zealand-based company, successfully integrated unmanned technology into commercial airspace while showcasing an innovative and interoperable mesh-network utilising vertical take-off and landing, fixed-wing and multi-rotor remotely piloted platforms. The platforms successfully operated without line-of-sight and radio frequency from the pilot, instead utilising commercial off-the-shelf mesh network technology to allow UAS operators to have a POV perspective and real-time control over flight. The demonstration highlighted the breadth and depth of expertise possessed by the MAG/Skybase team to cover the full range of C4ISR integration within the region across multiple platforms and operating systems. Present at the demonstration were members of the New Zealand Defence Force, Police, Fire and Emergency New Zealand, Airways and the New Zealand Civil Aviation Authority. MAG Aerospace, headquartered in Fairfax, Virginia, is a leader in providing and enabling real-time situational awareness to help its customers make the world smaller and safer. MAG delivers full spectrum C4ISR Services (operations, training, and technical services) and other specialty aviation to federal, international, civilian, and commercial customers around the world. MAG’s team of 1,000+ professionals operate 200+ manned and unmanned special mission aircraft, delivering ~100,000 flight hours annually on six continents in support of its customers’ missions. Why is Skybase applying for 500 sq kms of restricted airspace in NZ, unless it’s much faster and easier to obtain here than in Australia or Fairfax, Virginia? Incredible Skies Limited (an offshoot of Paua Enterprises), has applied for 874 sq kms of airspace, from ground to 3000 feet and encompassing all of the scenic Hokianga harbour. It is also advertising to attract foreign customers. Quite apart from the fact that businesses are seeking to restrict and control previously free and uncontrolled airspace (and make money from it), the GAA and others have legitimate concerns about the public safety issues surrounding UAV operations, particularly those BVLOS (beyond the visual line of sight) and what risk assessment and safety management systems these companies have in place. We know of one pilot who used the Official Information Act to seek further information about risk assessments from the CAA in relation to the Alexandra airspace application. The request – which has everything to do with public safety – was refused, on grounds of commercial confidentiality! consideration of the hazard register to establish the operator’s understanding of their operation and safety management. These details would normally be part of the operator’s exposition. I refer to your email of 4 September 2018 requesting all documents concerning Skybase’s risk assessment for their proposed activities, from the Civil Aviation Authority (CAA). to protect information which is subject to an obligation of confidence where making the information available would be likely to prejudice the future supply of similar information, in accordance with section 9(2)(ba)(i) of the Act. The GAA believes that the consultation process for restricted airspace applications is severely flawed, particularly when information relevant to making a submission is deliberately withheld by the CAA and the operator, and specifically where that concealed information directly relates to public safety. 3.4 Staff employed in the CAA Aeronautical Services Unit have delegations from the Director to designate airspace. The Director is not necessarily involved in the process of whether airspace should be designated as restricted. In another similar case (R191 Hokianga), the delegated staff did not carry out due diligence before restricted airspace was granted to a supposed UAV operator. We have received an email from a group of aviators based in Northland who are concerned about the CAA’s issuing of a large swathe of airspace, which has been reclassified from class G airspace, to restricted airspace active via NOTAM, to a private company. 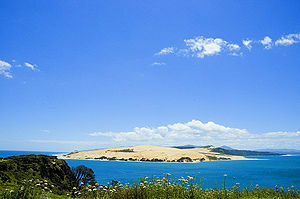 The area covers almost all of the scenic and historic Hokianga Harbour along with extensive coastline north of the harbour entrance and enormous areas of the Hokianga hinterland. The area has been designated NZR191 and has vertical limits extending to 3,000 ft. In contrast to this, the granting of the whole of the harbour and surrounds, to an altitude of three thousand feet, is clearly more to do with what the administering authority, Paua Interface Ltd, actually wants to use NZR191 for. The perception is that it wishes to charge individuals and companies (New Zealand-based as well as overseas interests) to come use ‘their’ airspace for trialling and developing drone technology while the company, as the administering authority, stands to gain financially as a result. This is clearly obvious when you visit the Paua Interface Ltd website. The website, labelled ‘Incredible Skies Project’, blatantly promotes the operation as commercial in making use of NZR191. Was consultation carried out with Northland pilots and operators before this restricted airspace was granted to a commercial company and if so, who with, and by what means? Please supply us with the feedback from this consultation, if it was carried out. Although the restricted airspace NZR191 is due to terminate on Thursday 21 December, has there been any application by the administering authority, Paua Interface Ltd, to extend its use of this airspace? In the event of a further application being received by the CAA, are you able to confirm that Northland-based pilots and operators will be fully consulted before it is granted? Query 1. Was consultation carried out with Northland pilots and operators before this restricted airspace was granted to a commercial company, if so who with and by what means? It has been established that no direct formal consultation was carried out by the CAA with Northland pilots and operators before NZR191 was granted to Paua Interface Ltd, although the applicant did note that they consulted with three local aerodromes in their application. Internal enquiries within the CAA, did not identify any known significant other aviation activity taking place in the area. Notwithstanding that point however, the CAA assessment is that this does not meet the processes outlined in Civil Aviation Rule Part 71, Designation and Classification of Airspace, nor the processes set out in relevant internal CAA policy and procedure documents relating to airspace decision making. This situation is unacceptable from my perspective and I have advised the Director of Civil Aviation of the matter for his full awareness. The CAA intends to use this as a learning opportunity and will ensure that any future applications for designations of restricted airspace are processed in accordance with Civil Aviation Rule requirements and relevant CAA policies and procedures. I will also be seeking a report on the specific actions involved before a decision was made on this particular matter. As I have outlined above, regulatory decision making of this nature without an appropriate level of consultation is not considered acceptable. Query 2. Please supply us with the feedback from this consultation. As noted above no consultation was carried out by the Civil Aviation authority in relation to NZR191. As the information requested does not exist, the CAA is refusing your request in accordance with section 18(e) of the Act. Query 3. Although the restricted airspace NZR191 is due to terminate on Thursday 21 December, has there been any application by the administering authority, Paua Interface Ltd, to extend its use of the airspace? A new company, Incredible Skies Ltd, has now been formed to manage the Part 101/102 operations. The CAA has received an application from it to extend its use of the airspace. As I advised you in my email to you of 20 November 2017, and consistent with my response to your first question above, Northland-based pilots and operators will be fully consulted with by the CAA ahead of any decision making on the matter. At the date of writing NZR191 remains due to terminate on 21 December and will do so. Any decision on whether or not to re-introduce it at any point in the future could only occur after this full consultation. The GAA and concerned individuals have filed submissions opposing the proposed restricted airspace application at Alexandra. We encourage everyone to consider the points made in the GAA submission and, if you wish, make your own personal submission to the CAA. The consultation document has a contact email address at the end. These applications for restricted airspace have serious implications for everyone in GA – not just the Alexandra and Hokianga aviators – and the Director has told us that he expects to see more such applications.